An aura of renewed optimism surrounds the Florida Panthers as they prepare to launch their 2015-16 campaign. After missing the playoffs for the 13th time in 14 seasons, the Cats may now be primed to buck that trend. The departure of some older depth players via trade and free agency has opened up roster spots for younger talent drafted by Dale Tallon over the last five years. After improving a league-best 25-points in the standings last season and making relatively minor roster adjustments, it seems unlikely that the Panthers will regress to “bottom feeder” status in 2015-16. However, the question remains whether or not they will continue their upward trend and find themselves on the right side of the playoff bubble at the end of the upcoming regular season. A decisive factor will be how well Tallon’s prospect pipeline and 2014 free agent signings can convert tight games into wins this year. With the preseason underway, here is an early look at some key players and how they became members of the Florida Panthers. Aleksander Barkov (C): The Florida Panthers drafted Aleksander Barkov with the 2nd overall pick in the 2013 NHL Entry Draft. Since then Barkov’s offensive contributions have increased (from 24 points during 2013-14 to 36 in 2014-15) and he is now a fixture on Florida’s top unit alongside Jonathan Huberdeau and Jaromir Jagr. Barkov is widely regarded as one of the cornerstones to Florida’s future. Nick Bjugstad (C): Bjugstad was drafted by the Florida Panthers as one of three first-round selections (19th overall) in 2010. Despite the Panthers’ struggles the past few years, Bjugstad has been among the team’s top producers since the start of the 2013-14 season. Despite undergoing season-ending back surgery in March, his preseason play suggests that he is poised to continue the trend this season. Lawson Crouse (LW): Selected 11th overall in this year’s Entry Draft, Crouse is expected to appear on the Panthers’ roster for at least nine games this season. According to an article published in March, the left winger “can play the game as a power forward, but also has nifty stickwork, patience, and grit that make him a strong two-way player.” Given these characteristics, Crouse will be an important complementary piece on a team with an enviable amount of depth at center and on defense. 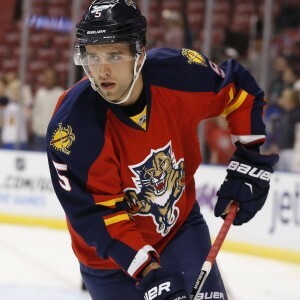 Aaron Ekblad (D): Ekblad was drafted by the Florida Panthers with the first overall pick in the 2014. The youngster played 81 games with the Cats during the 2014-15 season. He made an immediate impact, solidifying the team’s blueline as well as bolstering their scoring with 12 goals and 27 assists. 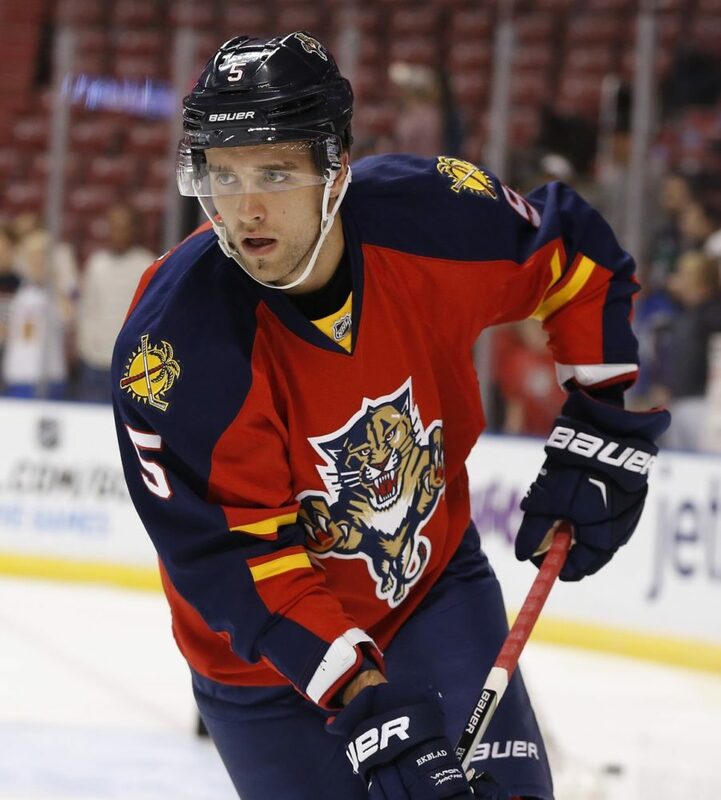 Ekblad’s performance during his rookie season was rewarded with the Calder Memorial Trophy. Rocco Grimaldi (C): A product of the USA Hockey National Team Development Program, Grimaldi was picked 33rd overall in the 2011 NHL Entry Draft. Since then, he has honed his game at the University of North Dakota and, more recently, with the Panthers’ former AHL affiliate in San Antonio, where he recorded 42 points in 64 games. Given the heart and high level of skill Grimaldi possesses, it is little wonder he has been identified by GM Dale Tallon as one of the possible beneficiaries of recent roster clearing moves. Jonathan Huberdeau (LW): Huberdeau was selected 3rd overall in the 2011 draft and has appeared in 196 NHL games with the Panthers over the course of three seasons. After being named the NHL’s top rookie in 2013, Huberdeau experienced a sophomore slump. 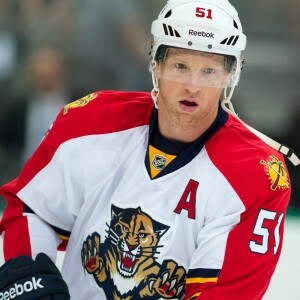 However, in 2014-2015 he bounced back to lead the Panthers with 54 points. The Hockey News, among others, have highlighted, how Huberdeau’s play of late has benefited from the veteran presence of linemate Jaromir Jagr. Dmitry Kulikov (D): The Florida Panthers used their 14th overall pick in the 2009 NHL Entry Draft to select defenseman Dmitry Kulikov. The 24 year-old has registered 27 goals and 94 assists in 386 games for the Panthers. Expectations have been high following Kulikov’s first few successful seasons as a Panther. However, his development since then has been adversely affected by injuries and relatively frequent coaching changes. Nevertheless, Kulikov registered 22 points in 73 games and finished with a +/- of 0 (the best of his NHL career) last season and continues to be a key part of Florida’s defensive depth. Alex Petrovic (D): Drafted by the Panthers 36th overall in 2010, Petrovic has spent most of his time since in the AHL with the San Antonio Rampage. 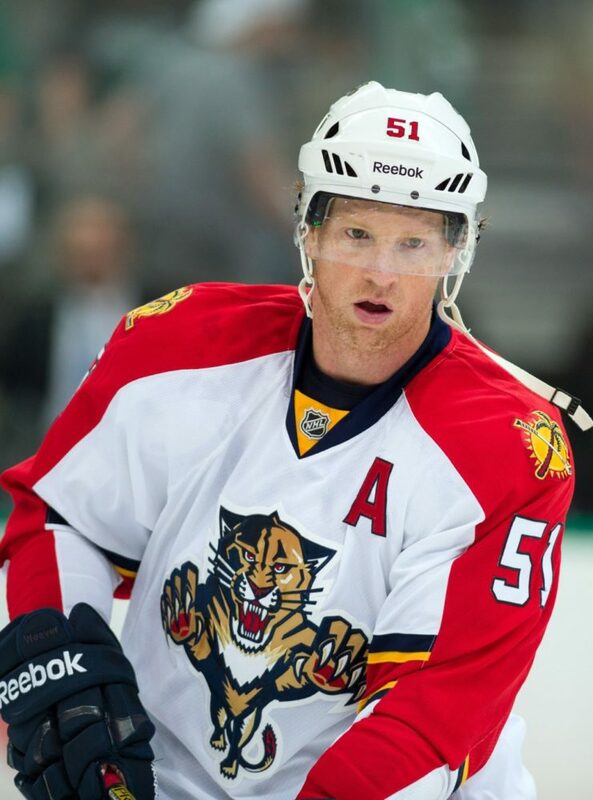 During the 2014-2015 season, however, he proved to be a valuable call-up and played 33 games for the Panthers. He has developed into a strong, physical blueliner with solid maneuverability who will be an asset to the team as veteran defensemen Willie Mitchell and Brian Campbell get older. Vincent Trocheck (C): Trocheck was drafted by the Florida Panthers with the 64th overall pick in 2011. He has earned an increasing role on the team over the past two seasons, playing 50 games in 2014-2015. He finished last season with 7 goals and 15 assists and is poised for a more permanent role with the team this season. Trocheck is part of a deep forward group about to enter its prime. Some pundits have gone as far as to suggest that Trocheck’s play has matched that of Nick Bjugstad. Brian Campbell (D): A little over a year after assisting on Patrick Kane’s Cup-winning goal, Brian Campbell was traded to the Panthers by the cap-strapped Blackhawks in exchange for Rostislav Olesz. At the time, Campbell had five years remaining on a contract worth $7.14 million per season. Since then he has amassed 144 points in 294 games for the Panthers and been a source of stability on the team’s blueline. Roberto Luongo (G): Roberto Luongo was re-acquired from the Vancouver Canucks the day before the NHL trade deadline in 2014 along with prospect Steven Anthony in exchange for goaltender Jacob Markstrom and forward Shawn Matthias. Luongo posted a .921 save percentage and 2.35 goals against average last season with the Panthers and will certainly be an integral part of any playoff push in the year ahead. Jaromir Jagr (RW): Jagr joined the Panthers in a deal that sent Florida’s 2015 second-round pick and 2016 third-round pick to the New Jersey Devils. His impact was immediate, recording 18 points in 20 games. However, many, including Nate Taylor of the SunSentinel, have pointed out that Jagr’s most important influence may be his mentorship of younger linemates Aleksander Barkov and Jonathan Huberdeau. Over the summer, Panthers’ GM Dale Tallon opted to retain Jagr’s services under a one-year, $3.5 million (plus incentives) extension. Brandon Pirri (C): Florida acquired Pirri from the Chicago Blackhawks in exchange for the Panthers’ 3rd round pick in 2014 and 5th round pick in 2016. In his first full season with the organization, Pirri played 49 games and established a reputation as a sniper, scoring 22 goals and notching 2 assists. Reilly Smith (RW): On July 1st of this year the Panthers sent Jimmy Hayes to the Boston Bruins with Reilly Smith and Marc Savard’s contract coming back the other way. Smith had previously been acquired by Boston from the Dallas Stars in the Loui Eriksson/Tyler Seguin trade. In four NHL seasons, Smith has played 203 games and registered 100 points. 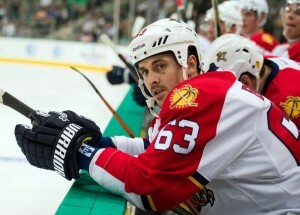 Dave Bolland (C): After a one-year stint in Toronto, Bolland and the Leafs failed to reach an agreement on a new contract. At the start of the ‘free agent frenzy’ in 2014, Bolland signed a five-year, $27.5 million contract with the Florida Panthers. Another former Blackhawk drawn in by General Manager Dale Tallon, Bolland was brought in to bolster Florida’s veteran depth at center. He finished the 2014-15 season with 6 goals and 17 assists in 53 games. Derek MacKenzie (C): Along with Bolland and Jokinen, MacKenzie joined the Panthers on July 1, 2014. The native of Sudbury, Ontario is mostly known for his fourth-line shutdown and penalty kill capacities. He has 82 points in 389 games – with the Atlanta Thrashers, Columbus Blue Jackets, and Florida Panthers. Willie Mitchell (D): Drafted by the New Jersey Devils in 1996, Mitchell has played for several clubs (in addition to the Devils) including the Minnesota Wild, Dallas Stars, Vancouver Canucks, and Los Angeles Kings. After winning two Cups in L.A., salary cap issues forced the Kings to release Mitchell via free agency. The Panthers signed him to a two-year, $8.5 million deal. The Panthers’ captain registered 8 points across 66 games last season, but has done a lot to shore up the team’s defense as well as improve the play of Dmitry Kulikov. Al Montoya (G): The Panthers signed Montoya as a free agent in July 2014 as well. He has played 111 career NHL games – with the Coyotes, Islanders, Jets, and Panthers. Between these clubs, Montoya has a .907 save percentage and 2.69 GAA. He remains Florida’s go-to backup goalie in relief of Roberto Luongo.